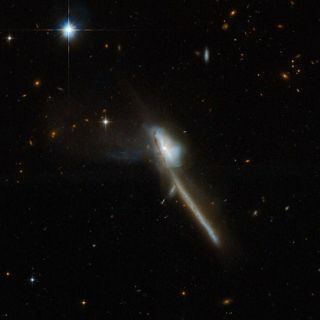 Markarian 273 is a galaxy with a bizarre structure that vaguely resembles a toothbrush. The "handle" of the brush is about 130 thousand light-years long and is strongly indicative of a merger between two galaxies. Markarian 273 has an intense region of starburst, where 60 solar masses of new stars are born each year. The galaxy is located 500 million light-years away from Earth. A huge setof new Hubble Space Images show galactic collisions in action and the varietyof peculiar forms that merging galaxies can take. The seriesof 59 new photographs, released today on the 18th anniversary of theHubble Space Telescope'slaunch, are the largest collection of Hubble images ever released together. Galaxymergers are now known to be more common than was previously thought. They were evenmore common in the early universe than they are today. The early universe wassmaller, so galaxies were closer together and therefore more prone to smash-ups.Even apparently isolated galaxies can show signs of past mergers in theirinternal structure. Our ownMilky Way contains the debris of the many smaller galaxies it has brushedagainst and devoured in the past. And it hasn't stopped munching away at itsneighbors: It is currently absorbing the Sagittarius dwarf elliptical galaxy. The MilkyWay isn't the top predator though, as our giant neighbor, the Andromeda galaxy,is expected to devour the Milky Way in about two billion years. The futureresulting elliptical galaxy has already been dubbed "Milkomeda." Though collidinggalaxies rush towards each other at hundreds of kilometers per hour, theinteractions can take hundreds of millions of years to complete. This gameof celestial bumper cars is driven by the gravitational pulls that galaxiesexert on one another. Typically the first sign of a collision is a bridge ofmatter connecting two galaxies as gravity's first gentle tugs tease out dustand gas. As the outer reaches of the galaxies begin to interact, long streamersof gas and dust, called tidal tails, sweep back to wrap around the galacticcores. As the coresapproach each other, the conflicting pull of matter from all directions canresult in shockwavesthat ripple through interstellar clouds. Gas and dust are siphoned off to fuelbursts of star formation that appear as blue knots of young stars. Given thevast distances between stars in a galaxy ?? the nearest star to us is 4.3light-years away ? stars rarely collide when galaxies merge. The Hubbleimages capture galaxies in various stages of the collision process and show thevariety of new and unusual shapes the mergers can create, including mergersthat look like an owl in flight and a toothbrush.